Bellincioni’s praise stands true today, but who is the woman who went on to become Mona Lisa’s greatest rival? Although some debate continues about the sitter’s identity, most art historians have identified the woman as Cecilia Gallerani, the beloved mistress of the duke of Milan and Leonardo’s greatest patron, Ludovico Sforza(shown here). Cecilia was only a teenager when she sat for this painting, but had already secured her status as a student of classical studies, a poet, musician, singer and renowned beauty. As the dress of the painting indicates, Cecilia Gallerani was not of nobility, but her father held several prominent positions at court. Ludovico had Cecilia installed in a suite of rooms in the Castello of Milan and court gossip indicated that he intended to make her his wife. Unfortunately, legitimizing their affair would have severed any strategic alliances for Milan and the smitten duke was not willing to let his heart rule matters of state. Instead, he married the equally alluring Beatrice d’Este, Duchess of Ferrara in January of 1491 (shown below)(2). After many jealous tirades, Ludovico ended his affair with Cecilla, but continued to provide for her and their son Cesare. He arranged a prominent marriage for her with Count Lodovico Bergamini and provided a sumptuous trousseau along with a villa near Cremona. It was here that Cecilia continued to entertain some of the most learned minds until her death in 1536. We are left with a curious letter that reveals Cecilia’s modesty in her later years. In a letter to Beatrice’s sister, Isabella d’Este, she tells Isabella that the portrait painted by Leonardo, “was painted when I was still at so young and imperfect an age. Since then I have changed, altogether, so much so that if you saw the picture and myself together, you would never dream it could be meant for me!” (4) Cecilia’s beauty may have not held the test of time, but her portrait certainly is a testament to Leonardo’s genius. (2) It is still not know if the portrait of Beatrice d'Este is truly her. I am so fascinated by this..I've got to read more! I've been on the look out for anything 'Beatrice' for a while...so if you can gear me a little, that would be great:) Thanks! Lucy - I read Beatrice d'Este: Duchess of Milan 1475-1497 by Julia Cartwright and also her book on her sister Isabella. Both are interesting reads, but a bit outdated. Have you read Karen Essex's Leonardo's Swans? It is fiction but REALLY good and she pulls together a lot of research on Leonardo and the two d'Este sisters. Napoleona - haha it does look like a worm/weasel cross but it is supposed to be an ermine. It has a double meaning. The ermine was part of Ludovico's heraldry and also symbolized purity. Supposedly, Ermines hate to get their white coats dirty and will die before they do. It looks more like a ferret to me! This painting has always been a favourite of mine. One of the mysteries for me... was how did she get such a hairdo!! The hair seems to be "glued" to the face and the chin. I knew enough about the painting to think "that's the woman with the ermine" but now I know "the rest of the story"! Must've been something around Leonardo. And if I'm quoting Paul Harvey, I think I need sleep. Compare this animal with the ermine in the portrait of Elizabeth Tudor. Neither one is very convincing. Elizabeth's ermine is too short-bodied and has black specks all over its body, where the actual animal only has a black tail tip. This one seems too large-- I believe the ermine is a small beast. And it looks to me strangely like it has dragon blood! Ferrets are fairly popular as pets in the U.S. They come from ancestors imported from Europe. They are smaller (unless Cecilia was a very small woman) and finer built. Mostly they are a darker brown, but I suppose other colored coats are possible. The actual ermine has its white coat only in (cold) winter weather-- it is brown in summer. I don't believe it is native to Italy, though of course one might be imported as an "exotic pet". Thanks for the ermine info. I didn’t know that their coats turn brown. Very interesting. Some art historians believe that the reason why the “ermine” looks so large compared to Cecilia is because she is actually only 9 or 10 in the painting. But you tell me...9 or 10? I find that hard to believe. I realize that children were always painted looking older than they actually were and they did age faster, but by modern standards she looks almost 30 so it is hard to fathom that she could be so young. The ermine in Elizabeth’s portrait is based on the coat that it creates and not the actual animal. (When an ermine’s fur is used in garments, its black spotted tail gives the fur a spotted appearance.) The English painters got the spotted thing wrong, but they cared less for accuracy and more for what the ermine represented. (purity). So I do think Elizabeth’s portrait has an ermine. I am not 100% convinced with Cecilia’s portrait. 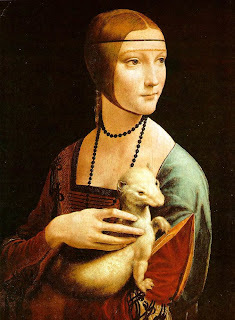 Plus, "Lady with a Dragon" is a much cooler name than "Lady with an Ermine." melisa - I think her hair is partially a cap so it looks glued to her face. Maybe someone else will know for sure? If you follow this link http://www.blueplanetbiomes.org/ermine.htm you can see the ermine in both color phases. Maximum body weight is 15 ounces! The "ermine" in Cecilia's arms looks bigger than my nine pound cat. Elizabeth's ermine, then, is about the right size-- I was thinking it was too small. The articles says that the male ermine is much longer than the female. Perhaps, then, Rlizabeth's is a female ermine, and that is why it looks short-bodies? The fur, of course, represents the heraldic "color", not the actual coat. I do not think, however, that the beastie was drawn from life. There is an entry in Elizabeth's accounts for a collar and chain for "our muskcat". This may have been a civet cat, a weasel relative that produces a "musk" used in perfumery. Sables were a popular fur in tudor times, for the very rich only. They were worn as complete skins, with abstract metal subsitutes for the face an feet. Another highly interesting post. I so enjoy reading your blog, cause you deal with the story behind many of the paintings we know so well. It's intriguing. I think I can contribute here. There's been some overpainting done to the picture, and especially the hairdo suffers from this. Originally her hair curved right over the ear, went backwards and ended in a coazzone, a thick roll of hair hanging down the back. The black band (lenza) crossing the forehead suggests that she also wears a small cap (trinzale) covering the back of the head, leading into the roll of hair. She seems to have wore a veil, which is the second line crossing the forehead (that one too retouched). With this style it wasn't uncommon to have a few loose strands of hair at the cheek/jaw, and chances are whoever overpainted it misunderstood the hair (or the veil) and painted a solid line there instead. Such a style was typical for Milan and the Lombardian area, but is believed to originate in Spain and/or Portugal. Milan had ties to Spain in the late 1400's, and the fashion of the area reflects this. The coazzone is a good example. So what kind of hairdo am I referring to? Similar style, she too has loose strands of hair, but a bit higher up. There exists a poorer version of this, where the face is more plump and the dress has become a two-coloured, flat thing, and the hair seemed a tad more graphic as well. Leonardo's other Milanese female portrait shows the same hairstyle - hair curving over the ear, the black band crossing the forehead, and a roll of hair can briefly be viewed behind her neck. Same hairdo in this small painting by Luini, but here with a lot of loose-hanging hair in front. She also lacks the band over the forehead, but wears a (symbolic?) high-pulled hat instead. Beatrice d' Este and her family as donors in a group painting. This shows the hairstyle well, but it also shows the clothing style of Northern Italy well: patterns, colours, stripes, and bows - lots of bows. Both for males and females! Very different from the clean lines of for example Florence. PS - the ermine might be a double pun - not only was it Ludovico de Sforza's heraldic emblem, but it can also reflect the sitter's name: galé is Greek for ermine, maybe a pun on the surname "Gallerani". I agree that the animal is huge in size, but it match well Leonardo's sketch "Allegory of the Ermine", where the ermine refuse to soil itself and is captured by a hunter instead. Here too the ermine is huge compared to to the human. Seems to be on purpose, maybe for a reason lost to us today.